Really great to have you guys join the forum. We look forward to your contributions. I've been a member and lurking for some time now and thought it was about time I said hi! I'm originally from Minnesota now living and working in Rhode Island. We just moved into our current house that has an interesting basement, think of a ranch split length wise, so long and narrow. I'm going to be modeling the Great Northern from the Twin Cities to Duluth, at least that's my plan. 8) Tell us anything else about yourself you'd like us to know. Not much to tell. An older gentleman, with a simple sense of humor. We frequent yard sales and, on one recent foray, I was able to acquire about 100 HO cars and 11 engines. No layout materials, though. So, I'm a rank beginner. I'll be building this up for my grandson. He's 5. It will be a basic oval with a few turn outs and spurs on a 4X8 sheet. The plan is for a desert village of adobe structures and a few commercial buildings and a lot of rocks and cactus. That's about it for my intro. Welcome aboard, Dave, Cowboy and Gene. Thanks for checking in and telling us about yourselves. Welcome aboard, Dan. There�s a lot of On30 activity around here and the guys are willing to share their knowledge. Enjoy yourself. Welcome Dan, Dave, Cowboy and Gene. Enjoy your time here it is a fine group. 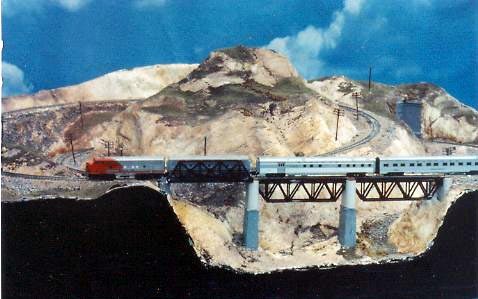 I discovered Railroad Line Forums a couple weeks ago- heard about it on another train bulletin board forum, and I was interested because your site was promoted as �home of craftsman structure modelers�. Sounds like one of my special interests. My webname is a variation on my real name, Kenneth Leigh Anthony. Here I am with my wife Barbara aboard the Capitan Miranda, a Uraguayan �tall ship,� one of four that visited the Corpus Christi, Texas area on July 4th weekend, 2010. 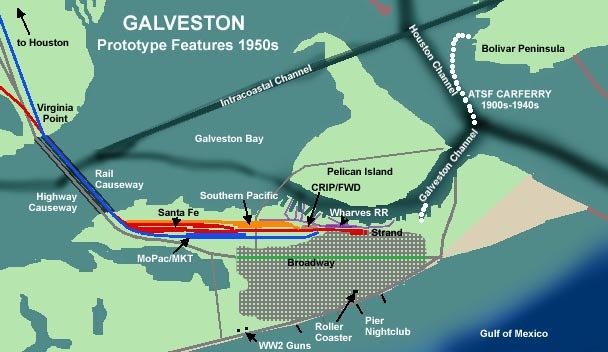 I grew up in Houston, Texas, my bedroom about 100 feet from a branch of the Houston Belt and Terminal and 500 feet from HB&T�s double track East Belt. I had Lionel as a grade-school kid and dabbled in HO in late teenagerhood. And I have done HO for friend�s layouts and on clubs. But my own modeling has been mostly in N since about 1970. A 2x4 foot somewhat generic �Colorado�(?) N layout built 1970 for a friend�s kid. 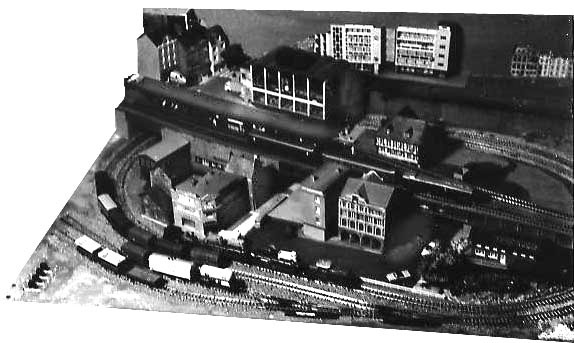 A 27x34 inch Berlin, East Germany N layout built after a European trip, 1971. But I have concentrated on Santa Fe since early 1970s and a member of various Santa Fe modeling groups since then. A generic �Southwestern� Santa Fe scene on a 30 x 40 inch N layout built in 10 days. I had a �Santa Fe in the piney woods of East Texas� N layout from early 1980s to 2007 when I dismantled it. One of my other interests is making movies. Winners Moon was about genius teenagers who won a science contest and got a trip to the moon. I guess it should also be obvious I like writing long posts with lots of pictures. My account has just been activated and I look forward to being part of the group. My name is Vernon and I'm in central Indiana. I've recently switched from HO standard gauge to HO narrow gauge and I'm in the planning stages of a small shelf layout for my home office. I have four of the Blackstone K-27s and several of the freight cars. I'm in sales and I do some freelance PC consulting. I've been lucking here for a while and though it time I got on board. I live in New Plymouth, New Zealand. I'm lucky to share this hobby with my son. (Alex 17). His interest shows no signs of subsiding. I got into the hobby because it was Alex's interest from a very young age. I was a sports guy and never imagined for a moment I would end up with a double garage full of a layout. Alex and myself are currently building a HO transition era north/west themed free lance layout. Alex is the DCC, track and wiring and loco repair guy. I'm the main structure and scenery person. I am also building an On30 logging layout. It will really be a large point to point diorama. About 3 x 4 m.
I have built the Sierra West tractor repair shed, great build, really enjoyed it. But that's about as far as I've got. I met a few of you guys in St Louis last year and at the CSS08. Hello to Nick O, Brett G, Elliott and Dave R.
Looking forward to attempting to keep up with you all and contribute something meaningful. Welcome to the Forum. Thanks for taking the time to introduce yourselves to the rest of the crew. We hope that the time you spend here adds to your enjoyment of the hobby! Nice to hear about yourself. Glad you joined. 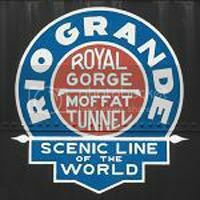 Hello all - My name is Ricardo and I'm a model railroader. It's been several years since I have been active, and there is currently no layout. I live in South Texas. Soon I'd like to try building a micro layout. This website is most enjoyable and everybody seems to be real nice. Thanks! How would Hieronymous Bosch have interpreted the Hulett? Welcome aboard, Kenneth, Vernon, Malcolm and Ricardo. We�re looking forward to your participation.